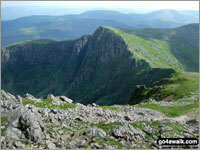 Trust the experts - these are the Welsh 'ridge' walks you really cannot afford to miss! One of the best things about walking in Wales is the opportunity to walk along high mountain Ridges* with grand vistas on either side. But because there are so many great Ridges* in Wales to walk along - deciding which one is the best to do first (or next) can be daunting. We've been walking Wales for more than 40 years and this list is a collection of 28 of our personal favourites. This list includes walks, routes and maps in Wales of various lengths, ascents, grades, airiness and popularity so there is bound to be something to suit you (and your energy levels). In any event, all will take you to the vantage points offering the very best views in Wales - so go on a nice day if you can. The Snowdonia walks any self-respecting walker should not miss . . .
Aran Fawddwy, Aran Benllyn, Esgeiriau Gwynion . . .
Arenig Fawr, Moel Llyfnant, Rhobell Fawr, Carnedd y Filiast (Arenigs) . . .
Cadair Idris, Mynydd Moel, Maesglase (Maen Du), Tarrenhendre . . .
Carnedd Llewelyn, Carnedd Dafydd, Pen yr Helgi Du . . .
Glyder Fawr, Glyder Fach, Tryfan, Y Garn, Carnedd y Filiast . . .
Moel Hebog, Craig Cwm Silyn, Trum y Ddysgl . . .
Carnedd Moel Siabod, Moelwyn Mawr, Cnicht . . .
Snowdon (Yr Wyddfa), Crib Goch, Yr Aran, Moel Cynghorion . . .
Never miss a tick in Snowdonia . . .
Or simply enter a walk, route, map or location name into our Search facility or surf one of our unique interactive walk selection maps covering Wales National Park.